Just when I was actually starting to warm up to the bike shorts trend that had me pretty intimidated last summer, the fashion world goes and takes the shorts up to level 10. Yes, denim cycling shorts are the latest iteration of the polarizing trend to emerge, and admittedly, I wasn’t ready for them initially. 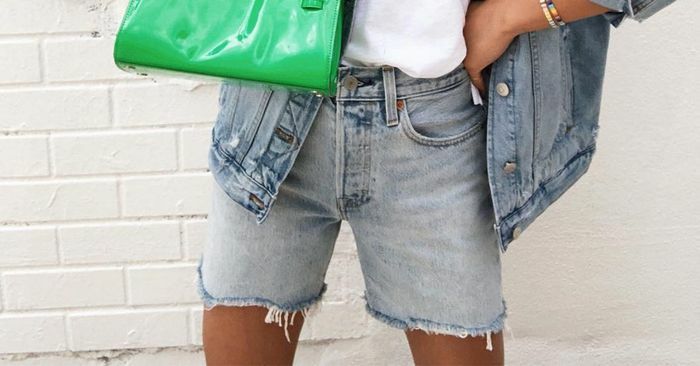 I think hideous is a little dramatic, but it explains why I was shocked to see jorts popping up last summer, when some of the absolute coolest girls in fashion started styling them on Instagram. Now as summer starts to materialize on the horizon, brands and retailers all over the internet have started stocking the shorts in a range of fits, from slim styles that mimic spandex bike shorts to roomier ones, confirming that they’re a thing. Like most of the other major 2019 trends on deck, I’m pointing fingers at the ’90s for being the main inspiration here. Whatever their origin, I’m totally intrigued by the style, and quite honestly thankful that they might just put an end to short shorts for good. I’ve just recently added a pair of denim Bermuda shorts to my closet, so keep reading to find a pair for yourself and get inspired by the outfit ideas I plan to try with them along the way.